Strong Medicine by Dr. Blake Donaldson | Eat Meat. Drink Water. This entry was posted in Classic Books, Resources and tagged All Meat Diet, Blake Donaldson, Carnivore, Carnivory, Diet, Fat, Health, High Fat, Keto, Ketogenic Diet, Ketosis, LCHF, Low Carb, Meat, Nutritional Ketosis, Obesity, Paleo, Paleolithic, Primal, Red Meat, Strong Medicine, Weight Loss, Zero Carb by esmeelafleur. Bookmark the permalink. It’s well worth the time in my opinion. I’ve read a good portion of this book months ago and as I recall, he also told his patients to eat potatoes with their meat. Not that I personally agree with that. I can’t eat potatoes myself. They make me severely sleepy. I’m wondering if he recommended them at that time for the Vitamin C…something I was pondering the other day because I was thinking about this book at the time. Funny you share it today. No, I highly doubt that was the reason since cooked potatoes will have virtually no vitamin C. And he only allowed potatoes once his patients were at their maintenance weight. 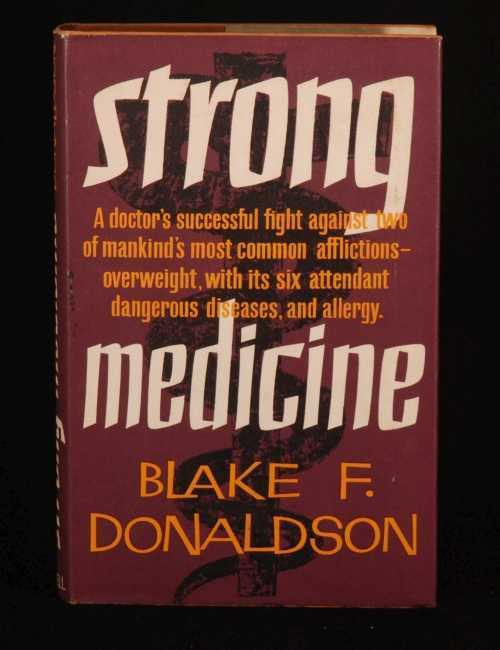 On page 55 of the book Strong Medicine Dr. Donaldson states that he chose potatoes to accompany the meat. So given where it’s stated in the book, it was not before weight loss took place. He also allowed for coffee at an unlimited amount at first but then states he later limited it. Still not sure why he used any starch at all though. He doesn’t give a reason on that page. Maybe for the fiber? I don’t know. I’m just guessing, just as I guessed at the reason being for Vitamin C. I don’t pretend to know for sure. Just starting conversation. Also, I noticed that I can no longer access your blog. Your last post comes up in my reader but when I try to see your whole blog I get one of those “Nothing Found” pages. Oh yes, that works! Thank you. I will file the link in my favorites. Glad you posted that pdf too, because I’d started the book and then hadn’t read the whole thing. I’ve started reading it again. Sorry, I hadn’t read far enough before my last comment. The author does state a reason for the potato as the ease of digestion. Lol, guess that would be a matter of individuality now a days. I’d heard of Donaldson before but never read him. And Newbold was completely new to me. These are amazing reads. When Donaldson wrote about “the old idea that calories are interchangeable, whether derived from protein, or fat, or carbohydrate” (43) I nearly fell off my chair. They had it all figured out long before there were all these sophisticated devices that we have now. Thanks so much for sharing these books! be what if the patients had eaten butter and salt with the meat, any comments? No idea because that is not what they did. You would have to try it both ways and see how that change affected your results. Pingback: Zero Carb Interview: Sergey Yakunin | Eat Meat. Drink Water. Dear Esmee, Thank you so much for posting about Dr. Donaldson. I downloaded the book and can’t stop reading it. It’s no different from the prescription of “Eat Meat. Drink water.” , except that he specifies the fat/protein ratio that he found most useful, as well as recommending suet as a fat. I had been using double cream and butter as additional fat, but I stopped these and immediately lost 2 pounds. I ordered suet and am now using that. Looks like a winner! I loved that he interviewed Stefanson as well. Yes, it’s amazing how this wisdom has been discovered and forgotten (or intentionally ignored) and then rediscovered throughout the years.